ESPEC developed the TSD-100 with an interior of 710mm x 345mm x 410mm, while strictly limiting the overall size of the system. The footprint is reduced by 40%, as well as lowering power demand by 60% (compared to our ETS4-2CW model). The TSD chamber achieves various tests from major international standards such as MIL, IEC, JIS. The TSD-100 chamber now includes a STT function. It monitors the specimen temperature using two sensors attached to the specimen and starts to count the exposure time, or proceeds to the next step once the specimen temperature reaches the preset temperature. This eliminates the need for pretesting, reducing the overall test time and ensures an accurate specimen temperature attainment. 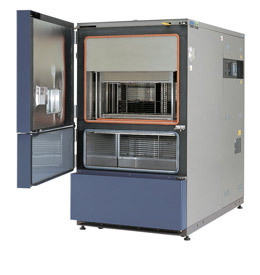 The specimen and test area temperatures can be recorded by connecting a temperature recorder. The “Soft-move-mode” is used to reduce vibration shocks when specimens are moving between the high and low temperature chambers in 10 sec. A braking system fitted to the drive mechanism prevents specimens from falling into the test area when the chamber stops operation. A cable port is provided on the right side to allow easy wiring of specimen for measurement during high and low temperature cycle tests (optional cable port can also be provided on the left side). 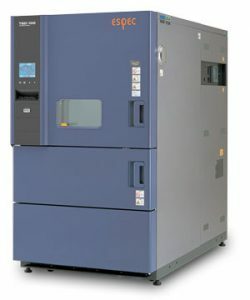 Featuring a 100L test area capacity, the chamber dramatically increases the processing capabilities and even allows to test A4 size printed circuit boards laid flat at once.